Origin and Habitat: 40 km North-North-East of Rocky Point, Namibia. 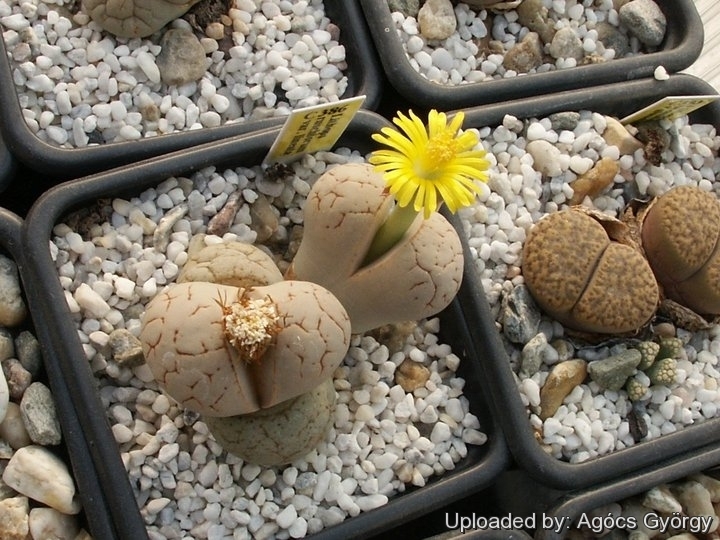 Description: Lithops ruschiorum var. lineata has more conspicuous markings, and also has smaller flowers and seed capsules, all the other characteristics are identical to Lithops ruschiorum. Bodies are greyish-yellow with some red to reddish-brown lines in dloghtly depressed grooves. However the distinguishing characteristics of Lithops ruschiorum var. lineata, appear to fall within the natural variation of Lithops ruschiorum and it should be synonymized with the latter, but it still has a value for a collector because they identify plants with particular characters. Desmond Cole field number C386: This population distinguishes for having rounded tops and orange lines. Lithops nelii Schwantes: has a characteristic combination of cordate shape and near white colour, all the other characteristics are identical to Lithops ruschiorum. Distribution: Namibia near Swakopmund. Lithops ruschiorum (Dinter & Schwantes) N.E.Br. : stone-like greyish-white to pale rusty pink vaiable in size and in the presence or absence of facial markings. Flower yellow. Distribution: Kaokoveld to Swakopmund, Namibia. Lithops ruschiorum C101 TL: 35 km NE of Swakopmund, Namibia: pale grey, few red lines. Lithops ruschiorum C102 (syn. nelii) 20 km E of Cape Cross, Namibia: whitish grey bodies. Lithops ruschiorum C241 65 km ENE of Henties Bay, Namibia: light grey top, irregular lines. Lithops ruschiorum C242 65 km ENE of Swakopmund, Namibia: light grey rounded top. Lithops ruschiorum C316 (syn. nelii) Near Cape Cross, Namibia: ivory top, scattered red lines. Lithops ruschiorum var. lineata (Nel) D.T.Cole: has more conspicuous markings, and also has smaller flowers and seed capsules, all the other characteristics are identical to Lithops ruschiorum. Distribution: Rocky Point to the Angolan border, Namibia. Lithops ruschiorum var. lineata C386 40 km NNE of Rocky Point, Namibia: rounded tops, orange lines.